>> How to Use Fracture and Cleavage for Mineral Identification? In mineralogy, fracture and cleavage are used to describe the tendency of minerals to break. 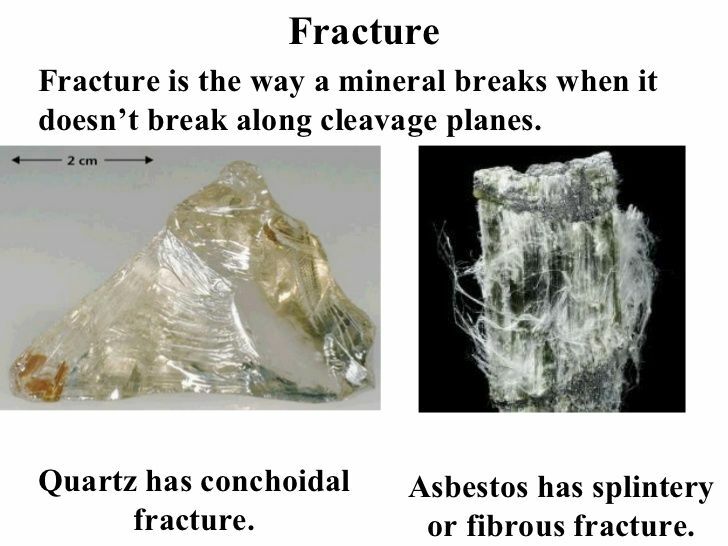 Fracture and cleavage is nothing but the positioning of the atoms that are present in a mineral, and how it can break when stress is exerted on it. To understand how fracture and cleavage are used for identifying minerals, it is necessary to understand what both these properties are first. A cleavage can describe how crystals can break when stress and pressure are exerted on them on a particular plane. If any part of a crystal breaks as a result of stress and the part that breaks retains a shape that is smooth or like a crystal, you will understand that the mineral has a cleavage. Minerals that do not produce crystallized fragments after they are broken do not have any cleavages. The quality of the cleavage. The habit of the cleavage. The number of sides exhibiting the cleavage. The quality of cleavage can be perfect, good, poor, indistinct, or nothing at all. Minerals that have the perfect cleavage can cleave and does not leave behind any rough surface. When the crystal is broken, a smooth plane appears. Minerals that have a good cleavage also leave surfaces that are smooth; however, they often leave rough surfaces along with mineral residues. A mineral that has a poor cleavage will not have a smooth edge, and the surface is rough and easily visible. If minerals have cleavages, but they cannot be noticed easily, they are known as the indistinct cleavages. There are also minerals that do not have any cleavage and hence the broken surfaces will be rough and fractured. A number of minerals are known to exhibit the cleavage only on a single side. However, a few minerals have cleavages on various sides of the crystal. There can be cleavages in one direction, two directions, three directions, or all directions. There are various habits of cleavages that exist, which depend on the crystallization mode of these minerals. Basal Cleavages: A cleavage that can be identified on the horizontal plane of a mineral, known as a basal cleavage. 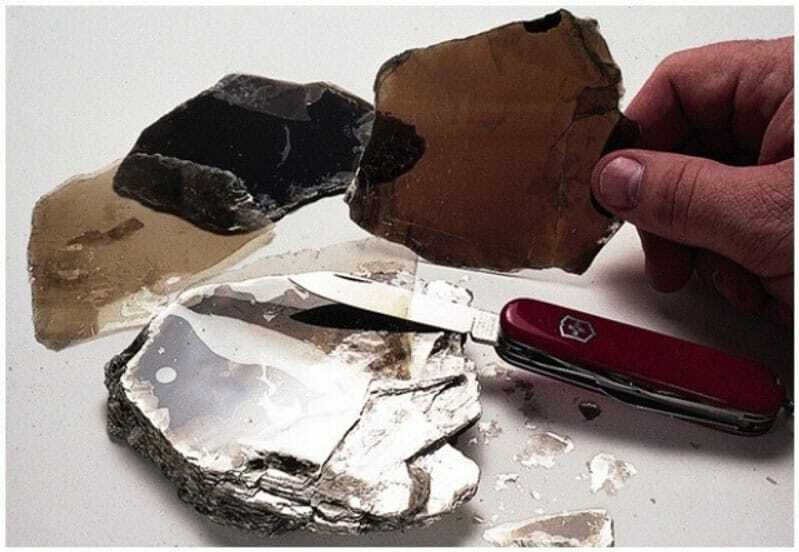 The best examples of the basal cleavage are Mica. Cubic Cleavage: Cleavages that are exhibited on the minerals of an isometric crystal system are known as the cubes. In this type of cleavage, the cubes can break off from a cube that already exists. For example, you have Galena. Octahedral Cleavage: A cleavage that is present on the minerals belonging to the isometric crystal system are octahedral cleavages. Such as; Fluorite. Prismatic Cleavage: Cleavages exhibited on the prismatic minerals are the prismatic cleavages. Take Aegirine as an example. Fracture is the description of a way how a mineral tends to break. It is not similar to parting and cleavage. Fractures occur in all the minerals that may or may not have cleavages. However, the direction of cleavage can diminish the presence of a fractured surface. Different minerals tend to break in different manners and leave behind surfaces that are described in a unique manner. A fracture can be described as smooth, splintery, jagged or irregular. Most of the minerals break in a similar manner, but some have unique fractures which should be studied. The conchoidal fracture is commonly seen, and it can also be described as the calm shell fracture. This fracture resembles a broken glass. 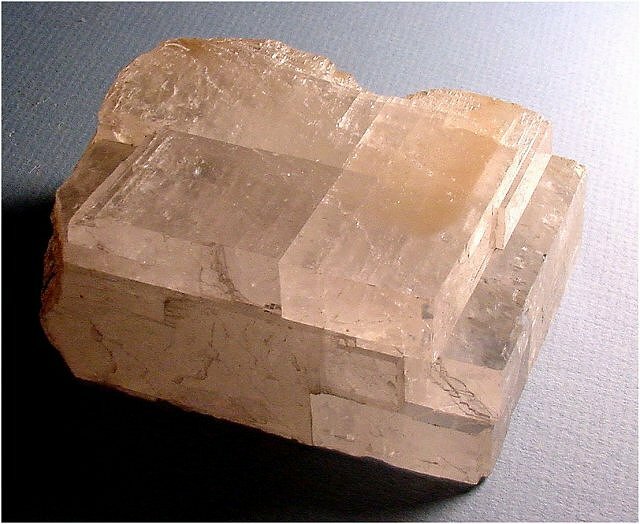 Minerals like quartz are known to have this kind of fracture. The subconchoidal fracture is also common. It is not curved like the conchoidal fracture, but it is smooth. Andalusite shows this type of fracture. Another important type of fracture is the uneven fracture, which is commonly found in minerals like anhydrite. A jagged fracture is responsible for sharp edges and points. Metals like copper or a few oxides and sulfides can show this property. The splintery fracture normally occurs in minerals that are fibrous or acicular. The chrysotile serpentine is a mineral, which has this splintery fracture. The earthy fracture is similar to the texture of the broken clay. This type of fracture is located in minerals that are massive in size and are loosely consolidated. This includes minerals like limonite. Sometimes fractures can be identified as hackly or irregular as they resemble each other. However, an experienced mineralogist can easily identify the difference between the different kinds of fractures that are present on a mineral. Fracture plays an important role in identifying a mineral. A mineral specimen does not need to be broken down to check if it has cleavage or a fracture. The areas where stress has been exerted on the mineral has to be checked first. The marks of fracture are hardly present in the minerals that have the perfect or good cleavages. 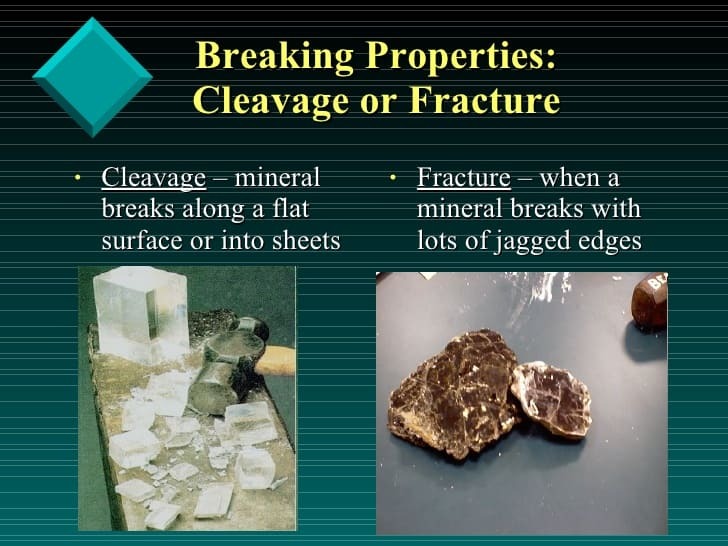 The minerals that have poor cleavages can fracture more in comparison to the ones that have perfect cleavages. The mineral has to be observed by a mineralogist to find out if there are any fractured edges or cleaved surfaces. If the mineral has cleavages, the smoothness of the surface of the mineral has to be noted down. There might be no cleaved surfaces visible on the mineral. This does not mean that there are no cleavages. In order to determine a cleavage, a piece has to be chipped off from the mineral. This is something to do carefully and gently so that the value of the mineral does not degrade in any manner. If fractures are discovered on the surface of the mineral, it can be determined that the mineral does not have cleavage at all. See? It doesn’t take a lot of know-how to undergo mineral identification if you know well about fracture and cleavage. Hope this article has helped your query, cheers!